Iʼve written about several National (insert food here) Days (or Months or Weeks) over the past several months. Looking back, itʼs all unhealthy food. Candy, hot dogs, etc. Iʼm putting a stop to that. Iʼm not saying I wonʼt ever write about junk food again. I canʼt promise that. Iʼm just saying Iʼm gonna give healthy food its fair shake. On that note, August 3rd is National Watermelon Day. Over the summer every day should be Watermelon Day, but on August 3rd it gets national attention. It deserves it. There is little more refreshing on a hot summer's day than a giant wedge of watermelon. The bigger the better. It makes me feel like a little kid all over again. I remember grabbing a slice bigger than my head and spitting all the seeds at my little brother. Honestly, is it even a summer gathering until someone busts out the watermelon? Food memories are special. Eating my grandmaʼs brisket during the holidays will always make me happy because it brings me back to spending time with my family. I already shared the memories that eating watermelon brings up for me. 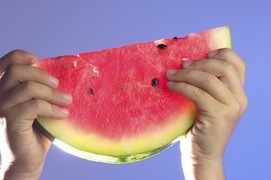 You can do the same with your subscribers with a National Watermelon Day email campaign. Itʼs a chance to break out of your usual template colors too. A watermelon pink email is sure to stand out. Have fun with it. Take your subscribers on a trip down memory lane during a month when there arenʼt really any religious, federal or Hallmark holidays.